When we’ve done analyses of the results of [our professional development efforts], we’ve found that teachers often move from a transmission approach where they tell the class everything and the students have been fairly passive, they’ve usually moved in two directions. One is retrograde. They’ve moved towards individual discovery. They say “I’ve been saying everything to these students for so long. What I’ll do now is withdraw and let them play with the ideas. I’ve been saying too much. I’ll withdraw and let them discover stuff.” That’s worse than the place where they started. The other place is where they move in and they challenge students and work with them on their knowledge together. That’s a better place. That’ smore effective. And so in professional development, people take a path. 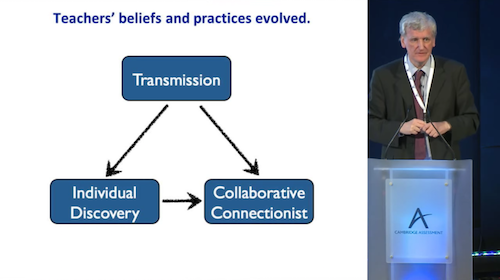 Over time they might move from transmission to discovery to collaborative connectionist. So they might actually get worse before they get better. That’s one of the problems with evaluating whether its been successful by looking at student outcomes. People take awhile to learn new things. Most of the time [in teacher professional development] we inform people of something and then we say “go and do it.” That’s not the way people learn. Usually they learn by doing something and then reflecting upon it. You don’t set out by changing beliefs and attitudes. People only change themselves as they reflect on their own experiences. If you’re designing a course, we usually start by recognizing and valuing the context the teacher is working in and trying to get them to explain and explore their existing values, beliefs, and practices. Then we will provide them with something vividly challenging. It might be through video or it might be through reading something. And this is really different to what they currently do. And through this challenge we ask them to suspend their belief and try and act in new ways as if they believed differently. And as they do this we offer support and mentoring as they go back into the classroom to try something out. And then they come back together again and it’s taken over then by the teachers who reflect on the experiences they’ve had, the implications that come out of their experiences, and recognize and talk about where they’ve changed in their understandings, beliefs, and practices. What’s great about Malcolm Swan and the Shell Centre is their designs for teacher learning line up exactly with their designs for student learning. It all coheres. Scott Keltner sent a drone up in the sky while his students plotted themselves down below. I emailed Scott and asked for his lesson plan and he sent back something involving playing cards and, frankly, none of it made any sense to me and I seriously don’t understand how the downside of cost, time, and effort could possibly outweigh the upside of drones (!) but I’m so curious. Bug Scott via Twitter to write up what he did here. Julie Reulbach used zombies to create a need for logarithms. Zombies are, obviously, catnip for some students, but that isn’t what caught my eye here. Julie understood that logarithms are a shortcut for inverting an exponential equation. And if you’d like to create a need for a shortcut it’s helpful for students to experience the longcut, however briefly. Watch her work. Ollie Lovell used one of my unposted tasks with a group of students in Myanmar who spoke very limited English and whose classroom had no electricity. Imagine how your favorite lessons would have to change under those constraints and then read how Ollie changed his. I learned a lot. Sarah Hagan shares a game from S T called Greed, which helped turn her students’ perception of box-and-whisker plots from useless to useful. Crucially, the game exploits the need for box-and-whisker plots, which is comparison between multiple sets. Creating a box-and-whisker plot for a single set of data will feel pointless, same as teaching someone to use a carrot peeler by using it to paint a house. That’s not what it’s for! Here are two reasons to be encouraged about the work and vision of the National Council of Teachers of Mathematics, followed by my hope for its future. NCTM is obviously interested in recruiting new members, along with all of their new ideas. Two years ago there was a panel discussion dedicated to technology in math education which featured a bunch of math Twitter-types. The following year saw an entire strand dedicated to ideas from those math Twitter-types. Then the math Twitter-types occupied the opening keynote at this year’s Nashville regional conference, immediately after which Robert Kaplinsky took my favorite photo from that conference. Just five years ago, these Twitter-types occupied the fringe. It’s so nice to see everybody making friends and learning from one another. This only bodes well. 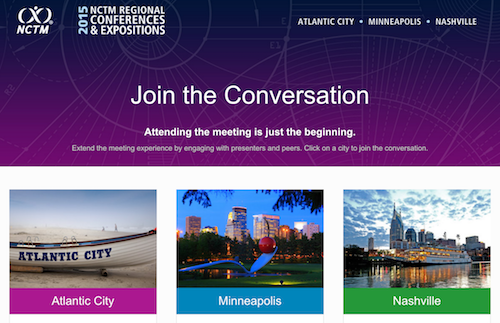 NCTM’s new conference website has promise. The history: Zak Champagne, Mike Flynn, and I ran Shadow Con as an experiment in extending the face-to-face conference experience. We offered speakers a more powerful platform on the web for interacting with attendees (live and virtual) than NCTM’s existing read-only conference program website. We reported the results of that experiment to NCTM’s executive team and that was the last any of us heard from them until this year’s regional conferences when they tweeted out their new conference website. Look at it! The featured speakers at the regional conferences each get their own page on a WordPress installation. On first glance those pages look just like a conference website. Title, description, and time. Just the facts. But speakers can add files, videos, and other resources. Then there is a comment box where attendees can get in touch before and after the session. A colleague of mine remarked: “It’s a mixed bag.” Yeah, but what a mix! Out of the 28 featured sessions across the three regional conferences, seven presenters don’t seem to have visited their page. That lack of attention has basically zero downside. Their pages look just like they would on any read-only conference program website. Title, description, and time. Just the facts. And across the other 21 sessions, there is a pile of activity! David Wees asks Jon Wray to clarify his session description. Savvy shopping, David! Helpful replying, Jon! Christina adds a Yelp-style review to Graham Fletcher’s page telling people they should definitely come to his session. Great social proof, Christina! Donna Leak’s page has video of her presentation. Video! A presenter had to cancel her session but leaves behind an apology and her slides! David Barnes collects tweets from his session and adds them to the comments afterwards. Tweets! Math Twitter-types like Annie Fetter, Kate Nowak, and Max Ray trick out their pages with resources and interact with attendees like the web veterans they are! All of this is possible without NCTM site’s but none of it is easy to do and none of it is easy to find. So here is my hope for the future of NCTM conferences. Extend this website to cover all presenters from all NCTM conferences and offer it to affiliate organizations for their conferences as well. I want to click Annie Fetter’s name on one page and see all the talks she’s ever given, across geography and time, including five years ago at some random state affiliate conference I never knew existed. I want to search for “Kate Nowak NCTM” in Google and find her past conference pages and also her upcoming talks. Before I attend a conference, I want to locate presenters whose talks seem to provoke a lot of online discussion afterwards, and then attend those. If NCTM makes this commitment, they’ll increase their value to current and prospective members several times over. For current members, they increase the value of conference attendance and decrease the pressure on attendees to attend every session. (Expect the question “Will you be posting your resources to your page?” to float around Twitter in the weeks leading up to every conference.) The conference page will connect attendees and speakers in the twelve months between annual conferences. Prospective members, the kind who wonder “Why NCTM?”, may start to land on conference pages more often than Pinterest boards when they search for resources. As those prospective members explore the resources on those conference pages, NCTM can recommend journals, articles, books, tasks, and other conference pages that may also be helpful. NCTM can point those visitors to upcoming conferences and sessions on those themes, converting non-members into members and members into stronger teachers. Until future notice, I am a single-issue voter in all NCTM elections and this is my issue. Other times I see a worksheet and it seems clear to me that a different medium would add – you name it – breadth, depth, interest, collaboration, etc. That’s the case with Joshua Bowman’s implicit differentiation worksheet, which he shared on Twitter. It’s great in worksheet form. 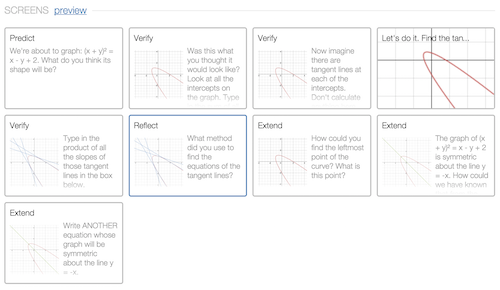 But the Desmos Activity Builder can add a lot here while subtracting very little. Activity Builder is the right home for this math. 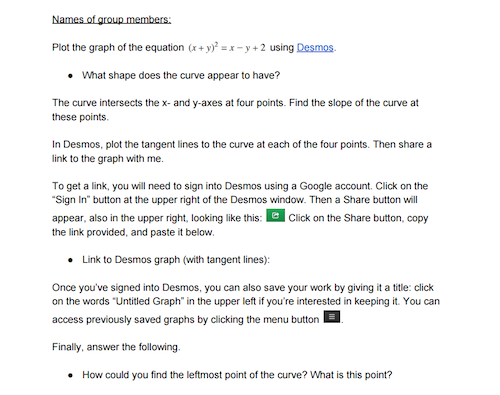 Bowman is asking his students to do their work in Desmos anyway and then copy and paste their calculator link into a Google Doc for feedback. Activity Builder simplifies that collection process. 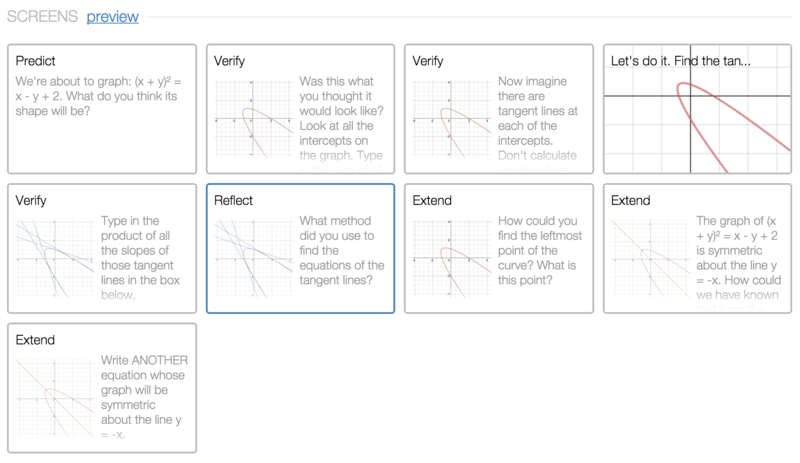 Students do their work in the Desmos activity. 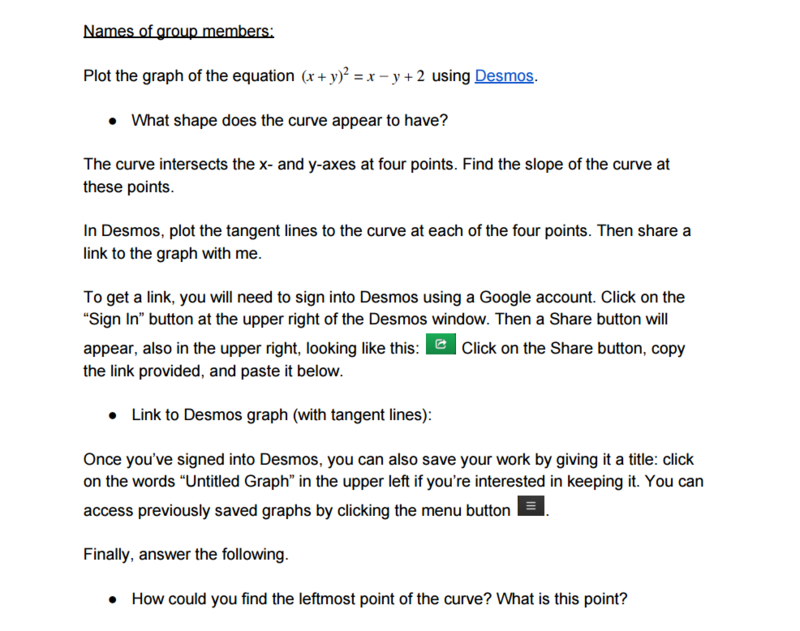 Desmos sends you all of their graphs, quickly clickable. When students see worksheets with seventeen questions running (a) through (q), they lose their mind. Let’s lighten their cognitive load and keep question (q) out of their visual space while they’re considering question (a). I added six more questions to Bowman’s worksheet, and they share particular features. These questions move productively from informal understandings to formal understandings, but they don’t live well together on the same piece of paper. You can’t ask students, “What do you think the shape of the graph will be?” when the graph is farther down the page. Bowman’s worksheet asks students to find the equation of the tangent lines to the intercepts of the graph. Some students may use sliders, other students may differentiate implicitly. I can quickly figure out which group is which by asking them to multiply their slopes together and enter the product in a new question. Which students differentiated and which students experimented? Long before I ask students to calculate that product, I ask them to simply estimate its sign. Envision the tangent lines in your head. Without knowing their exact slopes, what will their product be? That’s an informal understanding that assists later, formal understandings. Best of all, this Desmosification took minutes. Start somewhere. The tools are all free forever. Thanks, Joshua, for sharing your worksheet and letting us take a crack at it. I also like how the overlay view of your student answers could help lead to new questions, like seeing trends for student mis/understanding. This is great…but I need more. I want a way to be able to provide feedback to my students as they work through these activities.